ISBN 9790006498727. 9x12 inches. Key: Key d minor. 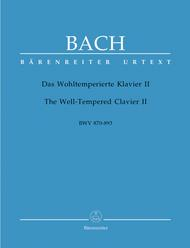 The Barenreiter Well-Tempered Clavier is masterpiece of keyboard literature, a unique URTEXT edition reproducing the musical text of the New Bach Edition. The Barenreiter edition presents the musical text as it is found in the sources. J S Bach was the first to conquer the entire breadth of tonality in his Das Wohltemperierte Clavier (The Well Tempered Clavier) by composing a collection of preludes and fugues in all major and minor keys - a truly revolutionary achievement. A detailed German/English preface by the editor Alfred Duerr included with each volume discusses the source material as well as the performance practice, including the execution of ornaments. Barenreiter editorial guidelines keep differing manuscript traditions and versions of the Well-Tempered Clavier separate. In many other publishers' editions, there is a mixture of the various manuscript traditions and versions, creating a work different from the original sources. In particular, the source for Volume 2 of the Well-Tempered Clavier is complicated as a "definite version" of this work by Bach has never been determined; the work survives in two distinct manuscript traditions which both go back to Bach himself. Until now, all printed editions have combined these two traditions into a single hybrid edition. 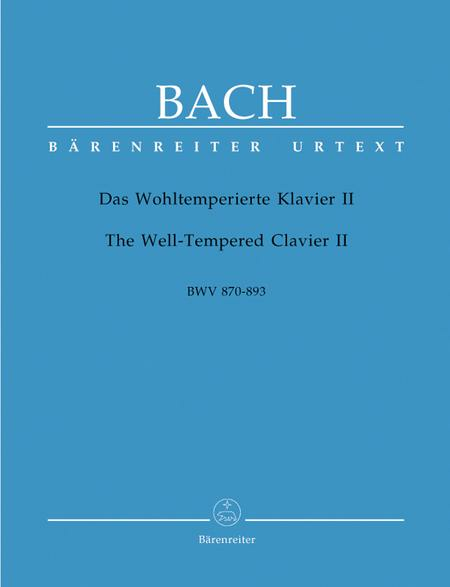 The Barenreiter Well-Tempered Clavier II keeps the two traditions separate and presents each piece in the version containing the largest number of Bach's subsequent changes; significant variants from the other version are added as alternatives so that they can be performed.